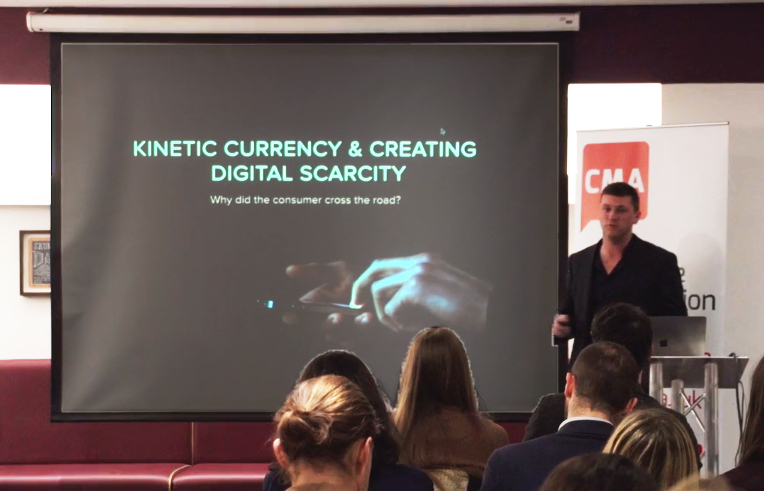 The question that Seth Jackson, CEO of Landmrk, asked in his presentation at a recent CMA Digital Breakfast is, how do you make a consumer ‘cross the road’? How do you get a customer to consume a piece of content? One method to getting a consumer to ‘cross the road’ is kinetic currency. Kinetic currency is when you offer an incentive to a potential consumer to engage in an activity in exchange for consuming your brand. Seth uses Stormzy as an example. Stormzy schedules a tour. Fans purchase tickets. They then travel to the venue to see the concert. The consumer has physically moved in order to consume content. Another example is Pokemon Go. This is an app where you must travel to different places to catch Pokemon—i.e. you must travel to obtain pieces of digital content. The consumer gives kinetic currency by moving around to catch Pokemon. Nike released a limited-edition type of sneakers. They created digital hotspots in specific locations where customers could purchase the sneakers online. The consumer had to physically go to the location (in this case, a specific Nike store) in order to buy these shoes. Seth works for a company called Landmrk (pronounced ‘Landmark’). Landmrk is a web-based platform that allows retailers top lace digital content anywhere in the world, at anytime—but not everywhere, thereby creating digital scarcity. This is the process of a typical user journey: The Engagement → The Journey → The Reward. The engagement is an agreement between the marketer and the consumer. The journey is the content that the consumer can explore, if they choose to. The reward is what the consumer receives if they deliver their kinetic currency. Some of the companies that have utilised Landmrk are CEX, Universal Studios, Lynx, Tesco Stores, Showtime, and the Homeland series. Here are some further examples of Landmrk creating digital scarcity. Homeland ran a campaign leading up to their series premiere in Manhatten. Fans of the show were able to walk around the island and discover original content before everyone else, via digital hotspots. CEX is a video/video-game/electronics re-sell chain with stores all across the U.K. They have a cult following for their digital advertisements. CEX began premiering their digital ads in their stores, thereby bringing consumers into their place of business. They also put most of their new ads online, but limited some to only be viewable in their stores. Lynx is a Men’s Grooming company. They recently ran a campaign that really experimented with marketing and digital scarcity. They produced around 1,000 Anthony Joshua spray deodorants and placed them around the U.K. in sports centres, boxing gyms, etc. Consumers were then invited to hunt these limited-edition sprays down via digital hotspots. Once in the correct location, the customer could put their information in their phone, and be mailed the limited edition deodorant. One of the best things about Landmrk is that marketers can react in real-time to fans or consumers needs. If there are not enough hotspots in one country, for example, it is possible to open more up during an active campaign. So going back to the question of, how do you make the consumer ‘cross the road’ and spend their kinetic currency? Create digital scarcity by offering rewards appropriate to your market.